Learn how to get The Harder They Fall Achievement - and the Locations of Behemoth and Mirelurk Queen. To get the achievement "The Harder They Fall...," you have to kill five Behemoths. Alternatively, you can kill four behemoths and a Mirelurk Queen. However, it is not so easy to find and defeat them all. In our guide we will show you how to find the Behemoth and how you can prepare for battle. Before you make yourselves on the hunt for a Behemoth or Mirelurk Queen, you should prepare yourselves properly. - You should equip with power armor for the fight with a behemoth or Mirelurk Queen. The fight will still be hard and you, but we will show you in separate Guide, How you can Repair and Modding Power Armor. - Take with you a through powerful weapon such as a Fatman or a rocket launcher, so you optimally finished the fight with one or two shots. Go to the West of the Commonwealth. There is the settlement Sunshine Tidings co-op. From Sanctuary you have to run for a while to the south to find this place. If you have arrived in a place, where mounted wrecked cars, you are correct. There you will find the Behemoth. Go to Malden Center in the northeast of the Wasteland. Use the tower as a guide and look for a small wreck car outside. In the car you will find the Moon Monkey, once you take him, the Behemoth will emerge. If you are traveling in the south of the Commonwealth, you will encounter Gunners Plaza. Just east of it, you will find a wetland. In this area, another behemoth is waiting for you. This behemoth can be found in the Swan’s Pond in Boston Common. Shoot him from a distance or go near him to start the fight. As a reward you will receive from him the unique melee weapon Power Fist. Go far west of the Commonwealth. There is the shelter of the mayor. Run to the south until you come across a structure of metal pillars. These are surrounded by power cables. Within the metal construct, awaits you a Behemoth. Pay attention to the deathclaws in the field. The Mirelurk Queen is a majestic monster that you encounter only once in Fallout 4. To find her, you must you go to the south of the Commonwealth. There you will find the Murkwater Construction site, this you have in the course of a Minutemen Quest free for colonization. The Mirelurk Queen is to be found inside the ruined settlement. There is actually another Mirelurk Queen. There is a shipwreck on the north Spectacle Island. If you pull the switch inside the ship you hear a roar and the Mirelurk Queen emerges a few seconds after that. 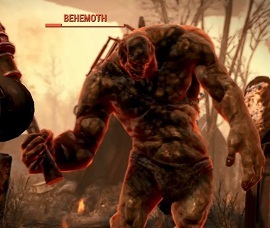 Unlike previous fallout games this one has respawning behemoths, so they aren't one and done. I found after a certain point a behemoth will spawn near the Super Duper Mart under the sign where the raider with the power armor spawns. Just kite it into the square near the SDM and run into the building and keep taking potshots at it until it goes down, this one counts for the achievement and there are certainly others which are easier to kill than that Mirelurk Queen, but even with those I have found easier locations to deal with them in the game, but it is much later on that they appear. there are several mirelurk queens in the game, one at the Castle, another at Revere Beach and a few others.